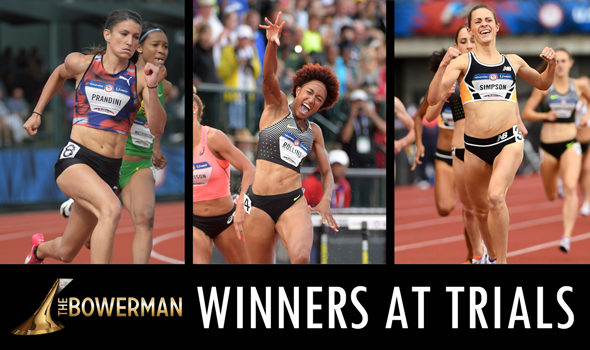 NEW ORLEANS — To get an idea of the caliber of athlete The Bowerman Award goes to each year, look no further than what transpired last Friday at the 2016 U.S. Olympic Trials – Track & Field. There were two former winners of The Bowerman Award in the final of the women’s 100-meter hurdles (Queen Harrison, 2010; Brianna Rollins, 2013) as well as two former finalists (Sharika Nelvis, 2014; Kendra Harrison, 2015). Going by their seed times, it was quite possible Team USA would be comprised of three women who either won or were finalists for The Bowerman Award at some point. Ultimately the U.S. title went to Rollins, who overcame the second slowest reaction time to dust the field in 12.34. Rollins ran in Lane 4 and beat runner-up Kristi Castlin by 16 hundredths of a second. Neither Harrison (both of them) nor Nelvis worked their way into the top-3. Queen Harrison finished fourth (12.57), Nelvis took fifth (12.60) and despite posting the fastest time in the world earlier this year, Kendra Harrison placed sixth (12.62). Sunday saw two former The Bowerman Award winners punch their tickets to Rio — Jenny Barringer (now Simpson) and Jenna Prandini. Simpson, who won the inaugural women’s title in 2009, ran like a seasoned vet in the final of the 1500 meters. She took over the lead with 800 meters to go and rolled to a half-second win over Shannon Rowbury (4:04.74 to 4:05.39). This will be Simpson’s third trip to the Olympic Games. Prandini, the 2015 recipient of The Bowerman Award, joined former Oregon winners Galen Rupp (2009) and Ashton Eaton (2010) on Team USA. The sprinter tumbled at the finish of the 200 meters and edged Allyson Felix. Prandini had the third fastest reaction time of the field and crossed the finish line in 22.53. There are now six former winners of The Bowerman Award on Team USA: Marquis Dendy, Eaton, Prandini, Rollins, Rupp and Simpson. The Rio Olympic Games begin Friday, August 5 and run through Sunday, August 21.